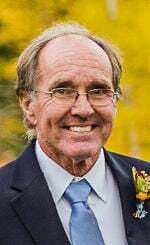 Darien, WI -- David W. Ames, 68, of Darien, WI, died Thursday, January 31, 2019 in Illinois. David was born to John D. and Isabelle Ames in 1950, and grew up on the family's farm in the town of Darien. He graduated from Delavan-Darien High School in 1968, and from UW-Platteville in 1972 with a degree in soil science. He spent his early career as a field manager for Seneca Foods of Janesville, while also raising his own corn and soybeans. Since 1998, he has been a farm manager for Neumiller Farms at their southern branch in Bath, IL. David was an avid outdoorsman, who spent what time he could hunting, trapping, fishing and taking photos. He cared deeply about wildlife management, and instilled a love of the land in his children. At work and in his personal life, he was a natural teacher and a mentor to many young people. David is survived by his wife, Pam Meisel of Darien; his stepdaughter, Amanda (Andrew) Noehl of Elkhorn (and their sons, Laken and Connor); his children: Ann Marie Ames (Ray Adkins) of Janesville, Robert Ames (Chelsea) of St. Louis Park, MN, Andrew Ames of Bath, IL, and their mother, Marge Ames of Fort Atkinson; his siblings: Phyllis "Suzie" (Ray) Henschler of Janesville, Janice (Bob) Berezowitz of Darien, Bonnie Ames of Jefferson, Diane Meske of Janesville, Dennis (Ellen Hann) Ames of Darien, John Jr. (Margie) Ames of Sturtevant, Tom (Barb) Ames of Watertown, and Ray (Sherri) Ames of Lake Geneva. He is preceded in death by his parents; and his infant children, William and Cindy Ames.